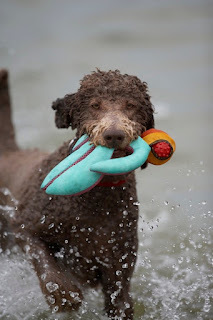 When photographer Rick Miles sent me the above oh-so-appealing photo of "Zoey", taken recently at a New Hampshire Poodle Party, I asked him if I could write to her owners to find out more about Zoey. Not only were Conde & Geoff kind enough to tell me a little about Zoey but also they sent a few more pictures, so Poodle Blog readers could catch a glimpse of Zoey in action! Miss Zoey is our first poodle. If I could sum her up it is that she loves life, loves people and loves food although not necessarily in that order. I think part of the reason she loves life is that she thinks everyone was placed on the planet to take care of her needs! She almost always has a smile, an effervescent, irrepressible personality. 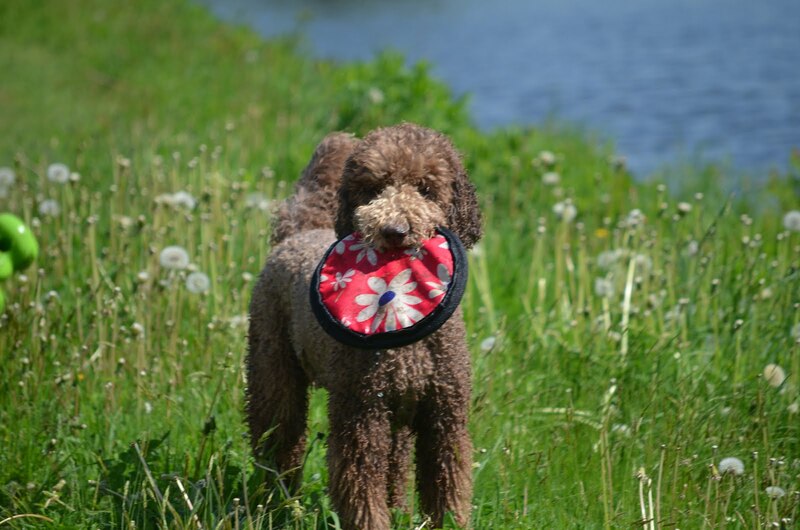 Zoey loves kids, loves to retrieve and play frisbee. She has competed in Dock Dogs, competes as part of my skijor team, and has modeled regularly for Fetchdog, including being the cover girl August 2009. Thank you Conde, for sending photos that help us understand Zoey's amazing zest for life. 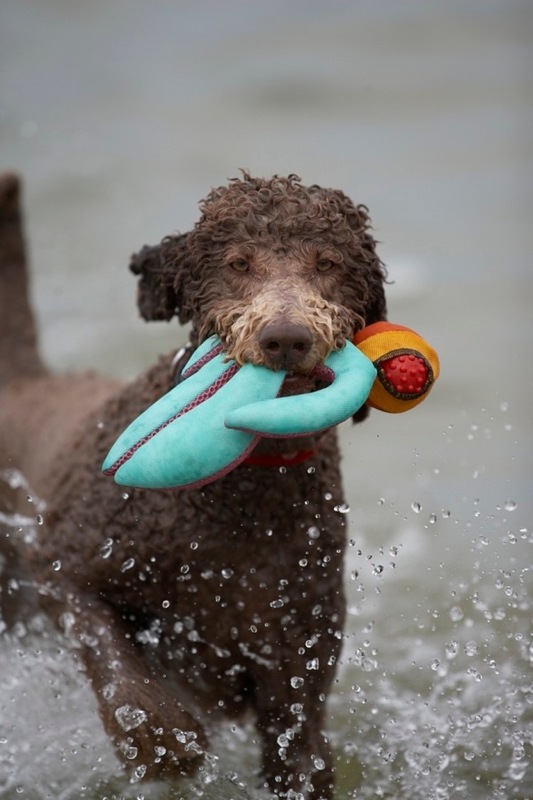 You are very fortunate to have such a special Poodle, and Zoey is very fortunate to have owners who allow her to participate in so many fun activites! 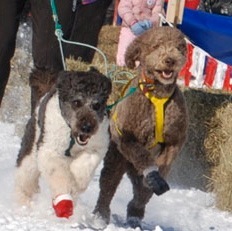 Since I own both Siberians and Poodles, I especially loved the skijor team photo. In Siberians, we call dogs who are able to participate in various dog sports, "multi-purpose" and they are greatly admired. It is certainly easy to see how Zoey became a "cover girl", as these photos of her are incredibly entertaining! 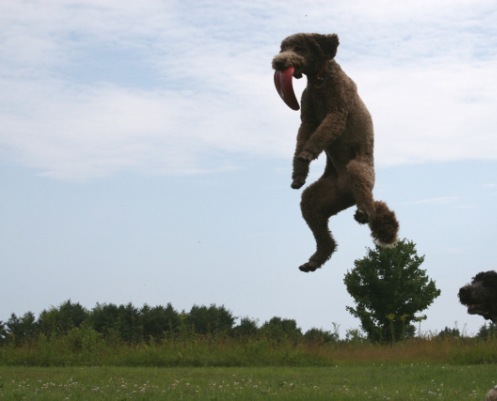 What an athletic, amazing Standard Poodle, you must be very proud. Thanks Rick, Conde and Geoff, for sharing Zoey with my readers! Bistro Bites Are Truly the Perfect Treat!